The Absolute Truth is the objective of devotional sacrifice, and it is indicated by the word sat. The performer of such sacrifice is also called sat, as are all works of sacrifice, penance and charity which, true to the absolute nature, are performed to please the Supreme Person, O son of Pritha. The words prasaste karmani, or “prescribed duties,” indicate that there are many activities prescribed in the Vedic literature which are purificatory processes, beginning from the time of conception up to the end of one’s life. Such purificatory processes are adopted for the ultimate liberation of the living entity. In all such activities it is recommended that one vibrate om tat sat. 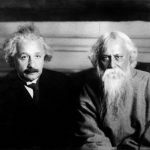 The words sad-bhave and sadhu-bhave indicate the transcendental situation. Acting in Krishna consciousness is called sattva, and one who is fully conscious of the activities of Krishna consciousness is called a sadhu. In the Srimad-Bhagavatam (3.25.25) it is said that the transcendental subject matter becomes clear in the association of the devotees. The words used are satam prasangat. Without good association, one cannot achieve transcendental knowledge. When initiating a person or offering the sacred thread, one vibrates the words om tat sat. Similarly, in all kinds of performance of yajna the object is the Supreme, om tat sat. The word tad-arthiyam further means offering service to anything which represents the Supreme, including such service as cooking and helping in the Lord’s temple, or any other kind of work for broadcasting the glories of the Lord. These supreme words om tat sat are thus used in many ways to perfect all activities and make everything complete. Text 26: Because the word sat indicating brahman, is present in the most auspicious things, it should be used in all auspicious activities whether material or spiritual. That is explained in two verses. The word sat indicates brahman (sad bhave) and the seekers of brahman (sadhu bhave). Text 27: Sat is situated (sthitih) in sacrifice and other works by being the goal of those works. 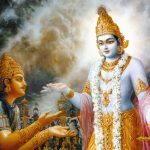 Any work suitable for serving brahman (tad arthiyam) such as cleaning the Lord’s temple, is called sat. 17.27 Therefore, devotion of persons of the first three stations who follow the Vedas in respect of sacrifices, austerities and gifts is called Sat, since it is auspicious. So the Vedas, Vedic acts and the three stations, expressed by the term ‘brahmana,’ since they are characterised by their connection with the words ‘Om Tat Sat,’ are to be distinguished from what are not the Vedas and Vedic. The word SAT denotes creation and eternal goodness. The pranava refers to the first breath OM which is vibrated at the commencement of all Vedic rites from the root word prana meaning breath. Properly pronouncing the pranava OM as AH–OOOH–MMMMM while comprehensively understanding its meaning without the slightest desire for rewards, by performing yagnas or propitiation and worship to the Supreme Lord with devotion and tapah or austerities and danam or charity as matter of duty, by japa chanting the holy names of the Supreme Lord Krishna: Hare Krishna Hare Krishna Krishna Krishna Hare Hare Hare Rama Hare Rama Rama Rama Hare Hare With great respect and love as well as the names of any of His authorised incarnations and expansions as revealed in Vedic scriptures are all considered SAT. Thus by duly initiated Vaisnava brahmanas evoking the sacred sound vibrations OM TAT SAT, the Supreme Lord is verily propitiated and worshipped. The Rig Veda confirms that yagnas that are performed for the exclusive satisfaction of the Supreme Lord without the slightest trace for expectation of rewards and are designated OM TAT SAT. The Vedas call these three divine sounds the performers of Vedic rites due to the fact that the potency of vibrating OM TAT SAT perfects any defects, insures success and pleases the Supreme Lord granting communion with Him. Lord Krishna now reveals the glories of the divine sound SAT which is also a name for the brahman or spiritual substratum pervading all existence. SAT is well established throughout the Vedic scriptures as the epitome of the ultimate truth and always recited in Vedic rituals. SAT confirms the ultimate reality and extinguishes any doubt or misconception about the non- existence of that ultimate reality which manifests all realities. SAT represents perpetual goodness in the eternal spiritual worlds as well as the temporary material worlds. The performance of all prescribed Vedic activities such as marriage or birth ceremonies is known to be SAT. SAT is also devotion to the Supreme Lord in the form of planting Tulasi and offering her leaves unto the Supreme Lord, picking flowers for garlands for the Supreme Lord. Constructing temples for the Supreme Lord, collecting wealth for the Supreme Lord, cleaning the temple floor for the Supreme Lord, singing, dancing and playing musical instruments before the diety form of the Supreme Lord Krishna or any of His aurthorised incarnations as revealed in Vedic scriptures is all SAT as well. 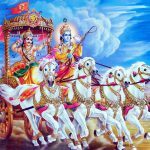 Any activity directly or indirectly related to the service, pleasure and satisfaction of the Supreme Lord as revealed in Vedic scriptures is also deemed as SAT. During yagna or propitiation and worship by the Vaisnavas and brahmanas the priestly class, tapah or austerities by the ksatriyas the royal warrior class and the danam or charity by the merchant class the absence of the conception of rewards for services rendered is SAT. Here the particles sa iti ca referring to SAT is used twice. The first usage denotes limitation by the words karma ca eva meaning matter of duty. The second usage denotes unlimited by the words tad-arthyiam meaning for the pleasure of the Supreme Lord. 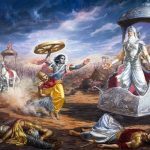 Thus it has been established by the parallel logic of opposites that activities devoted to the Supreme Lord Krishna or any of His authorised incarnations and expansions always follow sanatan dharma or eternal righteousness and can never be unrighteous. 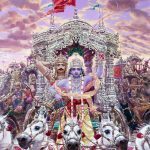 Whereas activities not devoted to the Supreme Lord Krishna regardless of how noble and well meaning they may be are never situated in righteousness because they exclude Him. The Chandogya Upanisad VIII.I.VI beginning tad yatheha karmajito lokah states: Those who at the time of death depart their bodies without realising the atma or immortal soul which is the goal of human existence for them moksa or liberation does not exist anywhere. But those who depart their physical body at the time of death having realised the atma have achieved the goal of human existence and experience moksa everywhere in all worlds. What could be more pathetic and sorrowful then performing prodigious austerities for impermanent results and wasting one’s life in the pursuit and acquisition of temporary materialistic rewards which have absolutely no value longer then the moment of death in a brief span of life not even reaching 100 years. So even by performing prescribed Vedic activities perfectly while harbouring desires for fame, wealth, power and dominion in this life; or performed for entry into the heavenly planets in the next life to enjoy without the burdens of old age and disease and fully satisfy the senses with exquisite and beautiful heavenly maidens who want to enjoy fully as well. All these thingy are as ephemeral as mist in the sun. When the merits of such activities are exhausted such jivas or embodied beings incarnate again in the material worlds of mortals to reap what they sow. In this way addicted to the rituals of the Vedic scriptures and attached to the rewards of the heavenly planets they remain revolving in the orbit of samsara the perpetual cycle of birth and death incessantly. Contrarily all activities dedicated to the Supreme Lord for His exclusive satisfaction without the slightest desire for any reward are of an eternal nature and bestow immeasurable benefit. Lord Krishna confirms in chapter 18 verse 56 beginning: sarva-karmanyapi sada meaning: Although always performing unlimited activities, by the mercy of the Supreme Lord and protected by Him one assuredly achieves the eternal, imperishable spiritual realm. Thus it has been established that vibrating the divine and transcendental sounds of OM TAT SAT at the commencement of all Vedic activities comprised in the ordinances and injunctions prescribed in the Vedic scriptures is eternally auspicious; if performed with devotion for the exclusive satisfaction of the Supreme Lord Krishna with full faith in Him or any of His authorised incarnations and expansions. In this way by the power and potency invested in OM TAT SAT all Vedic activities are insured success and confer eternal benedictions for the highest good of creation and all living entities. sat-bhāve — in the sense of the nature of the Supreme; sādhu-bhāve — in the sense of the nature of the devotee; ca — also; sat — the word sat; iti — thus; etat — this; prayujyate — is used; praśaste — in bona ﬁde; karmaṇi — activities; tathā — also; sat-śabdaḥ — the sound sat; pārtha — O son of Pṛthā; yujyate — is used; yajñe — in sacriﬁce; tapasi — in penance; dāne — in charity; ca — also; sthitiḥ — the situation; sat — the Supreme; iti — thus; ca — and; ucyate — is pronounced; karma — work; ca — also; eva — certainly; tat — for that; arthīyam — meant; sat — the Supreme; iti — thus; eva — certainly; abhidhīyate — is indicated.